OK, As years to come, you will loose your love to the old pool, including its old shape, style and its outdated pool mosaic tiles, etc.? Yes, now your pool needs inspiration and creation. 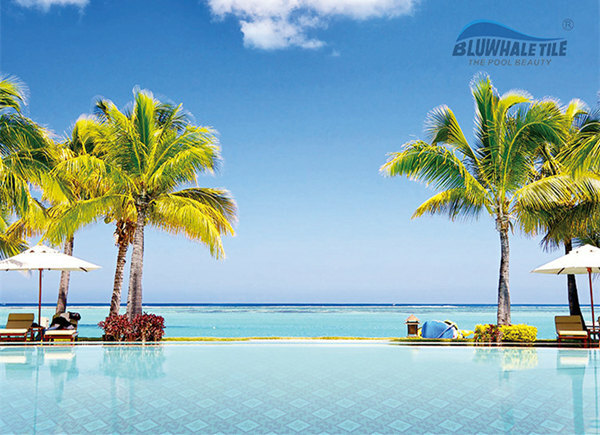 Bluwhale Tile has made a new creation and innovation in our swimming pool tile lines, featuring a series of triangle mosaic designed in both pure color and playful geometric motif. Our geometric triangle mosaic tile has caught our our global customers?? eyes for its incredible art forms, breaking a traditional swimming pool style. 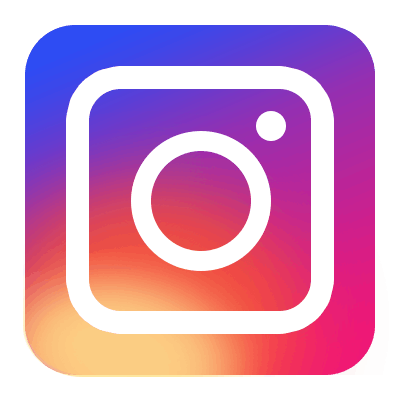 It is a fact that geometric tile can add stylish character, depth, graphic arts to different types of living spaces as well as the swimming pools. Apart from the building material field, the great elegance of the geometry has come back into the fashion once more, and we are feeling wow that this fantastic shape makes its resurgence on the swimming pools. To explore today? ?s geometric triangular mosaic tile and show off its beauty and diversity, we will show you the new-launched patterns to create inspiration to pool spaces by using these latest shapes. With blooming inspiration, it is time to enhance your inner creative gift to make your pool more for you. Designing your own version of the triangle mosaic tile for the pool easier than you think. Make a precise measurement on the pool area and get the tile quantity you need, and arrange them in brick bone way, a stunning graphic effect is made. Delve into is and have lots of fun! 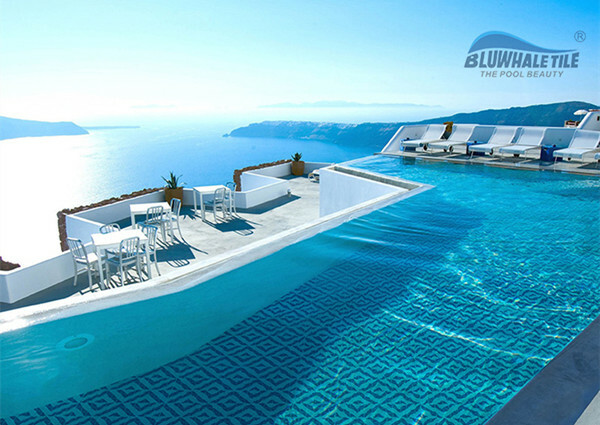 It is common to use open-air pool close to ocean in high end hotel and private villas. 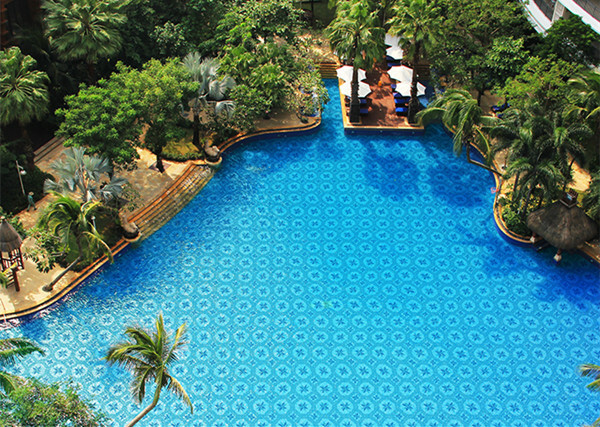 We get idea from the natural environment to make the windmill pattern mosaics, which is perfectly designed for the pool, every time when you swim in it, you won? ?t find a more modern and relaxing statement. 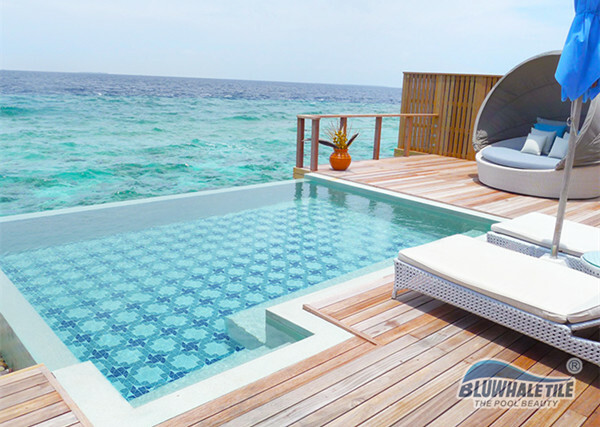 Just enjoy your pool time with the nice view and ocean breezing. Trying to make a peaceful space for your swimming pool? 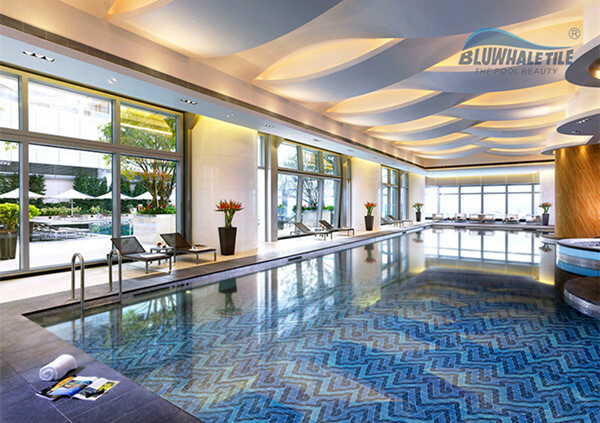 Option for a clear-line pool shape and blue-shades mosaics for bottom covering. We are glad to make a new pattern to elevate to the pool beauty when it is used as a feature pool bottom, which has become seamless part of the pool. Animal pattern would liven up any space. I do love the fish design triangle mosaic, it just creates an underwater world in a simple way, you will feel like playing with numbers of lovely fishes every time when you swim in the pool. An funny pool always offers you a good time. Mosaic tiles of decorative element would be nice. Incorporate the geometric tile of blossom flower pattern in the pool can work nice as an introduction to your pool style. If you wanna get a euro-style backyard pool, then the decorative triangle mosaic tile will bring you a big surprise! Let? ?s play with pattern. Geometric pattern can play well with each other. Using variety of triangle mosaics creates an energy pool that moves your eyes from one point of interest to another. It is interesting and helpful to make your pool spacious, seems like there is no boundary to the pool. If you are feeling brave enough, then the following pattern is a good choice for you. Arrange the mosaic pattern in a big windmill pattern with heart motif may make you eye-dazzling, but also eye-catching in the same time. 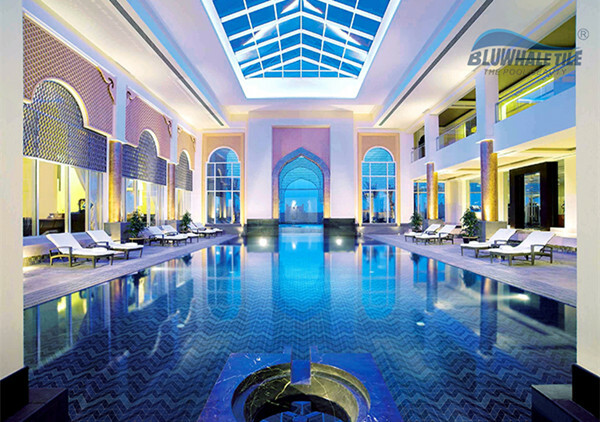 With three shadows of blue colors, the pool shines brightly under the soft lighting. It is only a triangle mosaic! When you make a creation on its pattern, you can create what you want for your pool, square, flower image, which will make the pool boring any more, and level up the whole space, values is added now! If you have been tired of your swimming pool surface shaped in common square, rectangle, hexagon or penny round tile, then consider choosing triangle for it, you will get a big surprise from it. Hope that Bluwhale Tile has raised your interest in using geometric triangle mosaics to create depth and movement to your pool as well as other applications. For more mosaic triangle tile for swimming pool, please head over to our triangle series, including both porcelain triangle tile and glass triangle tile for you. Looking forward to hear from you if you are in market for our triangle series, Bluwhale Tile will offer best price to all customers worldwide.